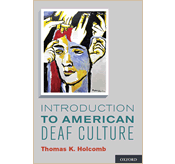 ← Can Writing About Food Spread Understanding of Deaf Culture? Tom: Have you wondered if we need something better, something different when it comes to our interpreting experiences? 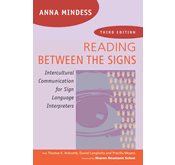 Have you ever wished that interpreters could do their work in a way that would make it easier for us to understand the message, easier for us to participate in “hearing” environments,” and easier for them to interpret our signed words more accurately. Good news! Dave Smith and I just completed editing a book that addresses this very topic. 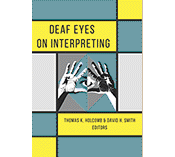 It is called Deaf Eyes on Interpreting and will be released by Gallaudet Press on June 30, 2018. Over 30 Deaf people shared their perspectives, ideas, and solutions on improving the interpreting experience for everyone involved. For the next 20 weeks, we will be sharing one chapter each week from the book by showing a five minute video summary in ASL. The goal is to generate discussions among Deaf people, interpreters, and others on issues relevant to our experiences with interpreting. To begin, Trudy Suggs explains the value of storytelling from her chapter, The Importance of Storytelling to Address Deaf Disempowerment. 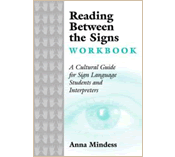 Posted in Deaf Eyes on Interpreting, New book, videos from book contributors and tagged american sign language, ASL interpreters, Deaf Culture, Deaf Eyes on Interpreting, Gallaudet Press, Storytelling, Trudy Suggs. Bookmark the permalink. Awesome! This is a huge issue and a great time to address it!!! Looking forward to the video summaries and engaging in discussion with my community! I assume the summaries will be shared on this site directly, correct? Yes, the new videos will be shared here, once a week.